Valentine’s Day is coming soon and many of you have probably made plans for the special day. Some of you are spending time with your boyfriend/girlfriend, while some of you are going on a romantic date. There are many things you can do for those of you who don’t have a boyfriend/girlfriend or not going on a date. You can for instance have a Valentine’s party or spend time with your friends and family. But whatever you choose to do, a Valentine’s Day gift will always brighten up the day. Rosegal is currently having a valentine’s day gifts 2018 collection where you can find the best valentine’s day gifts. We also have Rosegal Valentine’s Day promotion promotions. If you are interested, you can find more information in these links https://www.rosegal.com/promotion-Valentines-day-special-65.html?lkid=12603349 . 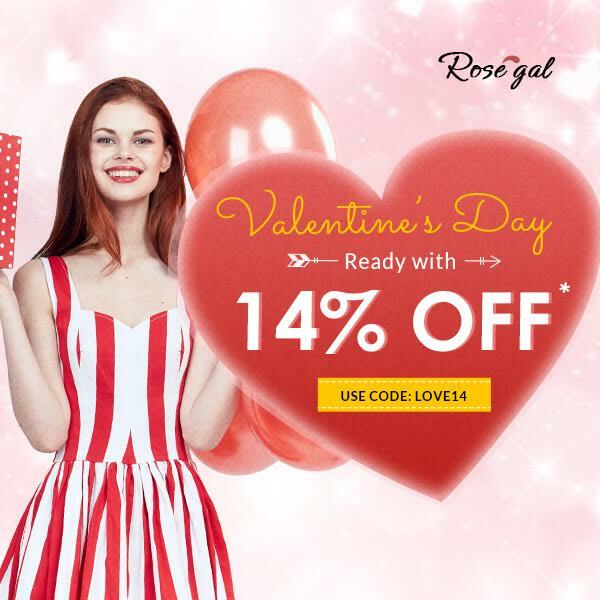 Find the best valentines gifts for him and her at Rosegal, and save up to 60% off, check out cheap ties, shirts and pants for men, necklaces, babydolls and scarves and https://www.rosegal.com/?lkid=12603349. You can get 10 % off by using the coupon code: RosegalChen. We at Rosegal wish you a wonderful Valentine’s Day, filled with much love and happiness.